Malaga's official gallery included shots of a bleeding Vern Christensen after slipping on a barrier. 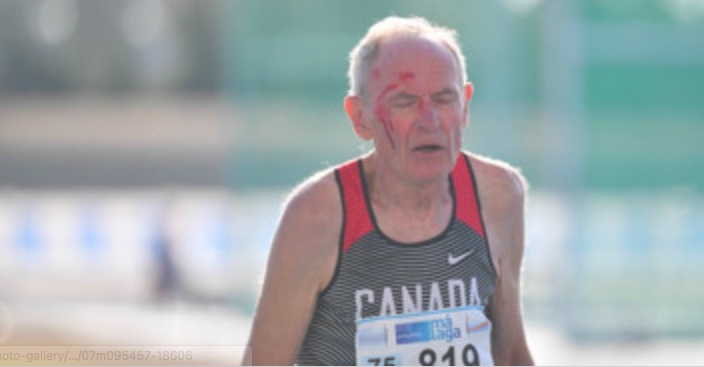 American M75 middle-distancer Ev “Doc” Murdock was eighth in the 2K steeple at Malaga, but he sent me photos of the fifth-placer — Vern Christensen of Canada. Vern is shown at the finish holding his bloody forehead. Ouch! What happened? Has anyone mentioned to you that the steeplechase barriers were not coated with the usual nonslip surface? Instead, they were painted with high-gloss paint. As a result, they were amazingly slippery as soon as they got wet. Those of us who normally step on the barriers as part of our technique for jumping over them slipped. Several of us fell and got hurt. He called Vern one of the top-rated age-group steeplers in the world. You’d think the IAAF-certified safety officials would have caught this (the unsafe barriers). I don’t know whether the barriers at Malaga City Stadium (where the M75 race was held) were outliers. Or whether all the steeple barriers were the same elsewhere. But an apology is in order. Vern holds his head at finish of M75 steeple. Special Report: Were rules broken for sake of Yanks’ record shot in Malaga 4×100? 1 Comment on "Were steeple barriers at Malaga safe to step on? Canadian M75 racer ended up bloodied"
Another example of facilities that should have been checked by technical experts on one of their four or five visits before the championships took place. I really think after this and the state of throwing circles among other inadequacies across the championships someone needs to question what is actually undertaken on these visits which come out of the pocket of the athletes entry fees.